Rather than watching news commentators bicker about what’s going on in the Middle East, we should all go share a gyro at Salem Garni’s Mediterranean Market and Deli. We could argue about the origins of baba ganouj (Turkey? Lebanon? ), or whether Halal meat tastes any different than meat processed the western way. Or we could talk sports–Salem is as well-versed in the NFL as he is in the more beautiful football game, popular in his native Libya. Salem Garni is the quintessential neighborhood grocer–a storyteller whose stories linger in that hazy place between fact and fiction and a cook who knows your order by heart. Like many Boulderites, Salem went to CU; however, he says, family ties in grocery lured him away from his college major and into the family business. His father had a store in Libya when he was growing up, where they sold and prepared Italian food (did you know that Libya was an Italian colony in the early 1900s?). Salem founded the Mediterranean Market and Deli in 2006 in the space next to Salvaggio’s on east Pearl Street. He’s now in a strip mall on a very short block of Bluff Street, just off of 28th. Like his father and like his shop-keeping neighbor Maria Nguyen (of Asian Seafood Market), Salem’s stock generally reflects a geographic region but holds no fast and hard rules about which countries are included. Furthermore, as far as cuisine is concerned, there’s a significant overlap in what is eaten in some parts of North Africa, the Middle East, and the countries that hug the Mediterranean Sea. Take fava beans, for example. Cans from Lebanon, Syria, and Turkey vie for space on one shelf, and Salem tells me that they are best eaten for breakfast, gently fried up with olive oil, cumin, and eggs. This is a recipe right up my alley. 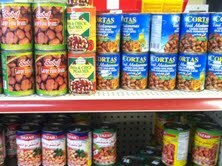 Since I love “Mediterranean food,” I ooh and ahh over almost everything in the shop. Vats of olive oil (from Tunisia, Italy, Greece), cans of roasted eggplant and stuffed grape leaves, coolers of pita bread and haloumi, and a deli counter stocked with bulk olives, ground lamb, and local (!) halal beef make me want to a) cook, and b) move to a small white-washed Greek island. On our tour of the market, Salem also shows me less-familiar items, such as Russian pate and chestnut puree from Romania (which he himself has grown to love, spread on toasted pita bread). He is particularly proud of the “Bosnia” section of his store, an example of how a shopkeeper can meet the niche need of an underserved, little-known community. In the early 1990s, Colorado experienced a small surge of refugee resettlement from Bosnia. 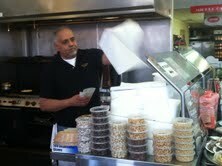 Most Bosnians, I learned from Salem, are Muslim, as are most of the food cultures that his store represents. Their tastes, however, veer from the stereotypical Mediterranean and tend towards the European tradition of dark coffee and sweet biscuits. Salem therefore stocks tins and vacuum packs of Bosnian (and Greek) coffee, as well as boxes of chocolate-dipped, sugar-coated sweet treats. In addition to eating baked goods, says Salem, the Bosnians love to cook them. So he’s got Bosnian flour, too. In terms of non-comestible items, the most intriguing are the hookahs (just because), and the bottles of rose water, of which Salem stocks a few varieties. He claims that spa owners from Aspen and Vail order this from him, requesting it to be sent via UPS to their fancy mountain salons. As if this is not exotic enough, when I ask Salem where the rose water comes from, he answers quite simply, Persia. The market’s location near business offices and other retailers guarantees a steady lunch crowd. In fact, when I was there, the majority of Salem’s customers were visiting the deli side of the store. Salem was manning the counter, most often shaving gyro meat off a large skewer, to be served with fries and a drink for just $7. Nothing on his menu costs more than that, and the portions are generous (think falafel, baba ganouj, hummus, etc). Many people also grabbed a slice of baklava for dessert–these, as well as other desserts and moussaka, are handmade and delivered once a week by a local Greek man. (out there on the eastern plains). 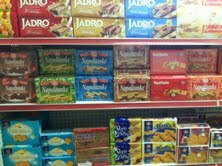 Ever the ambassador, he stocked the store with some Mediterranean items, one being Ayran, a sour yogurt drink. Although he convinced some customers to try it, the verdict was unanimous: Salem was not selling a palatable product, this was spoiled milk. Yuma is good for fuel, laughed Salem, not Middle Eastern food. Boulderites, on the other hand, are more skilled in their worldliness and tell him that everything is delicious; however, they also ask if he carries gluten-free pita bread. To this he replies: just don’t eat the pita. Thanks, this was a mini vacay to the Mediterranean for me. I’m looking forward to trying fava beans fried with olive oil, cumin and some eggs. Maybe some gyro shavings instead of bacon? Yes, please. And though I don’t agree soccer is more beautiful than football, I do agree that this was a really interesting article about a great, must-visit market.